New Years Eve will be upon us soon! Why not create a great signature cocktail for your party? Wow your guests with something unique and d’lish! Consider serving one very special signature drink – and pre-mix it in large batches. Put it in pretty bottles or in a pitcher and then all you have to do is shake it up. This keeps your cocktail precision perfect! Serve 1 red wine, 1 sparkling or champagne and one signature cocktail – keep it simple! You don’t want to have to be tending bar all night. Fill a cocktail shaker with ice. Measure in the rum, raspberry vodka, lemon juice, simple syrup and pomegranate juice. Cap and shake vigorously, then strain into a martini glass. Add a tiny splash of soda water. Do a very light grating of nutmeg over the top of the drink and drop in the orange zest. *To make simple syrup: Combine equal parts sugar and water and bring to a quick boil. Cool, bottle, and refrigerate until needed. Place all the ingredients in a stainless steel or glass pan and stir well to incorporate the brown sugar. Place over low heat and warm. Do not boil! Let flavors steep for at least 30 minutes before serving. How exciting – my Douglas Fir Sparkletini (my favorite holiday cocktail! ) from my upcoming cocktail book is featured as a “hot cocktail” on glam.com! 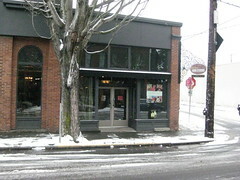 Seattle’s got snow! 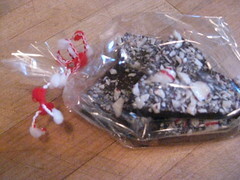 So at the Food Studios we decided to use our extra time and make up some tasty Dark Chocolate Peppermint Bark. This recipe is reminiscent of Frangos texture and is fun and easy to make at home. It is also great to make up for tasty gifts. The perfect thing to stay in and make this weekend. In a medium bowl, warm the chocolate, butter, salt, and extract together over a bain-marie (pan of barely simmering water), whisking until the chocolate is just melted. Remove from the heat, sift in the powdered sugar, then stir to combine well. Line a 8″ square baking pan with foil – shiny side up and make is very smooth. Spread the mixture into the baking pan. Sprinkle evenly with the crushed candies and press into the chocolate. Refrigerate for at least 2 hours before serving. My friend JJ McKay is known for his fantastic, even legendary, dinner parties, and practices what I call easy elegant entertaining. Just in time for your holiday parties, I’m going to share JJ’s tips with you. Don’t go overboard with what you serve. Don’t make things that are too complicated or too unfamiliar. Do things that can be prepared mostly in advance then finished off at the last minute. It will allow you time to mingle with your guests and not spend the whole party in the kitchen. Invite a high-spirited, diverse and eclectic group of people who don’t all know each other. Have everyone introduce themselves before sitting down to dinner and say two sentences about what is new with them. Have seats assigned so couples are mixed up. This gets the ball rolling for lively conversations and gives lots of energy to the party. Give everyone at the table a “job”: opening wine; lighting candles; serving the first course; pouring water. This gets people moving about instead of making awkward small talk. Here’s my menu for a Northwest winter dinner party, complete with blushing pears, hearty root veggies, and toasty nuts. We start with Creamy Roasted Parsnip Soup with Chevre and Walnut Crostini. The soup can be made ahead and then just finished off. Then we move on to an entrée of oven-roasted Spiced Chicken with Pears and Port—full of autumn flavors—accompanied by effortless Herbed Lemon Orzo. The meal is topped off with Chocolate Espresso Martinis—shaken up, served in small martini glasses, and topped with a dollop of chocolate whipped cream—for just a little something sweet at the end. These are also great served with little butter cookies or your favorite chocolate cookie baked in mini size. So, I’ve supplied the menu, now all you have to do is invite a delightful group of friends! To serve the soup and finish the crostini: Preheat oven to 375 degrees F.
In a small container, combine the cocktail pre-mix ingredients. Then transfer to a pretty bottle with a pour spout. The pre-mix can be made up to 1 week in advance and kept refrigerated. To make the cream: In a small bowl, combine the whipping cream and chocolate sauce and whip until very, very softly peaked. For each cocktail, fill a cocktail shaker with ice and then measure in 2 ounces (1/4 cup) of the pre-mix. Shake vigorously for 10 seconds, then strain into a small martin glass. Top each cocktail with a dollop of the whipped cream and garnish with coffee beans and/or chocolate. Out here in the Northwest we are blessed with beautiful mountain views and in the winter, that means ski time! There is a great new book for all you skiers out there that will get you geared up for this snowy season. 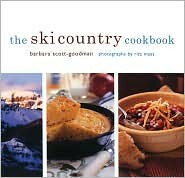 The Ski Country Cookbook by Barbara Scott-Goodman, Chronicle Books, has great recipes for before you head out, for when you get back inside and fueling up in-between runs! Hearty breakfast dishes like Smoked Chicken and Apple Hash or Homemade Granola and tasty comfort food like Wine Braised Short Ribs and Macaroni and Cheese will just hit the spot. Whether your “thing” is hitting the slopes, building forts and snowball fights, or staying inside by the fire, these recipes will be sure to keep you warm when it’s cold outside. The perfect holiday gift for your favorite ski bunny! On New Year’s Day I will be on KOMO 1000 talking about traditions and how we all celebrate the New Year differently. I would love to hear about some of your own New Year’s Day traditions. Please post a comment below to share your traditions with me and be sure to tune in January 1st at 4:15 and 6:15 PST. You can also hear it online at KOMOnews.com. I’m excited to hear from you! Now is the time to get started on your holiday party planning because, before you know it, the big day will arrive and you want to be prepared!!! Even if you aren’t having a big holiday get-together, it pays to keep a back up handy for those merry visitors who pop by unexpectedly. First and foremost, let’s do away with the tired spread of chips and dips, spinach dip and teriyaki meatballs. Now I’m not saying that these aren’t delicious, quite the opposite—I love a good meatball! But likely you will be running into these go-to appetizers over and over again this holiday season; why not try something sure to dazzle the taste buds? One tip for sure holiday success is to make appetizers ahead or buy quick-assemble ingredients ahead for easy weekday entertaining—cheese, fruit pastes, marcona almonds served with crostini or pita chips. Dish D’Lish tomato jam with cambozola is my favorite on rustic crackers like Essential flat breads. And don’t be afraid to dress up store-bought items and make them look like your own. Keep appetizers simple and down to three steps if possible (no little smokies in the Crock-Pot with mustard and grape jam please!) Pick up a jar of Peppadew Peppers available at most deli olive bars or at Dish D’Lish in Ballard, and stuff with creamy goat cheese and a marcona almond — sprinkled with chopped parsley… so very festive! Recipes follow for a couple of my favorite apps –ones quick and easy the other is a bit more labor intensive — but worth the work! Place the water, milk, butter, salt, and garlic in a heavy, medium-sized saucepan. Bring to a boil over medium-high heat. Transfer the mixture to a mixing bowl and, with a hand-held or standing mixer, beat on medium-high speed. Add 1 of the eggs. As soon as the egg is partially incorporated, increase the mixer speed to high. Add the remaining eggs, ONE AT A TIME, when each previous egg is well incorporated. (THIS IS IMPORTANT) The mixture should be smooth. Set the dough aside for 5 minutes, then stir in 3/4 cup of the Parmesan. Let the dough cool for about 15 minutes before piping or shaping. Mix together the poppy seeds and remaining 1 tablespoon grated Parmesan. Sprinkle the top of each dough ball with a little of the mixture. Bake on the upper rack of the oven for 22 to 25 minutes, or until puffs are golden. Serve warm. You can make these a few hours in advance, keep at room temperature, then reheat in a hot oven for a few minutes. Chef’s Tips: If you’re short of baking sheets, have more dough balls ready on sheets of parchment. When a batch of puffs is done, remove the baking sheet from the oven, pull off the parchment filled with cooked puffs, and quickly place a waiting parchment sheet of dough balls onto the baking sheet. Recipe Copyright © 2008 by Kathy Casey. In a small bowl, mix the goat cheese and chives. Spread your favorite crostini or crackers with the mixture and top with dollops of Blueberry Lavender Chutney. Garnish each piece with a tiny sprig of fresh thyme. Lightly brush baguette slices with olive oil. Place bread in a single layer on baking sheets, sprinkle with French Seasoning Salt, and toast until just crispy. Let cool before storing. Chef’s Tip: Crostini can be made in advance, cooled THOROUGHLY, and stored in airtight containers for up to 3 days. If necessary, re-crisp in a hot oven for a couple of minutes.